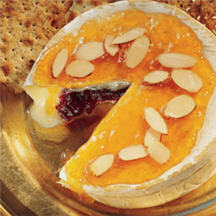 A warm, fruity brie cheese appetizer filled with whole cranberry sauce and topped with a glistening glaze of apricot preserves and crunchy sliced almonds. Serve with butter crackers. Break up cranberry sauce with a fork and place in center of cheese. Cover with top of cheese. Spoon apricot preserves over top; sprinkle with almonds. Bake for 8 to 10 minutes or until soft and slightly melted.